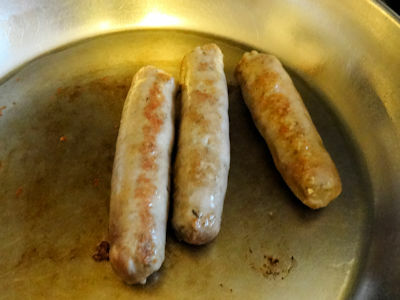 I have made several different sausages in prior posts. However, I would really like to make them spicier. This is a problem as I have firm instructions from She Who Must Be Obeyed to keep the heat down. I decided to try and sneak some heat in. If she liked them, great. If not, I could always duck and cover. I went with my standard seasoning mixture but cut back on the black pepper and added ground dried chipotle. 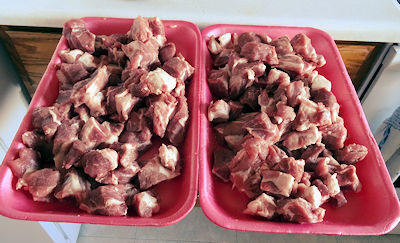 I started by cutting the pork into 1 inch cubes. I put them in the fridge for 1/2 hour to chill. You will note that I use weights not liquid measures. I find that there is no way I can get a consistent result without using weights. Spices are ground to different consistencies and one brand may have more in a teaspoon than another. A little more or less salt, pepper or chipotle makes a lot of difference. I really suggest you get a small scale that can read to 0.1 grams. Also, as my herb garden is covered by snow, I went with the dried herbs. I put the spices on the pork cubes and tossed to coat them. I ground the meat with the medium plate on my KitchenAid grinder attachment. I put the meat in the fridge for 1/2 hour to chill. Then I spread it on a tray and pushed my fingers into it. I sprinkled 50 ml (1/4 cup) of cold water over the meat. 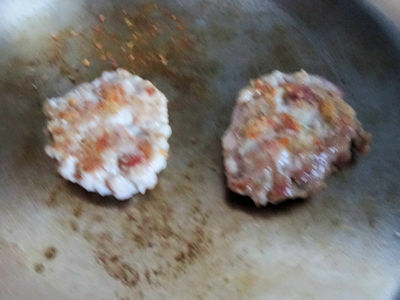 I mixed the meat by folding it in half, pressing and turning the tray 1/4 turn. I repeated this for 3 minutes. I put the meat in the fridge for 30 minutes to chill. While the meat was chilling, I did a fry test. This will not give you an exact taste of the finished sausage as it takes a day for the flavours to even out but it will let you know if you have way too much or too little of any flavour. 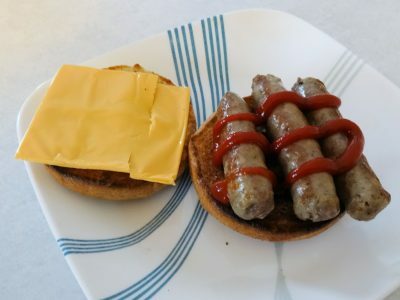 At this point you can form the sausages into patties or stuff them into sausage casings. I went with 22 mm collagen sausage casings. I used my sausage stuffer and six feet of casing for each 1 kg (2.2 pounds) of meat. When the sausage was stuffed, I pinched an indentation every four inches. I cut the sausages at the indentations. 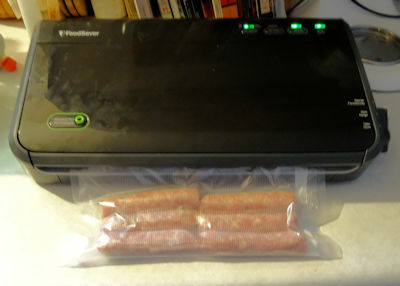 I vacuum sealed the sausages and let them sit for a day before cooking any. I fried some up for a breakfast sandwich. Success! There was just a nice warmth in your mouth after you eat these and She Who Must Be Obeyed even liked them. There is a great consistency with a nice salt/herb/heat blend that even kids wouldn’t have a problem with. 1 kg (2.2 pounds) pork shoulder cut in 1 inch cubes. Make sure the pork is well chilled. Pour on meat cubes and toss to coat. Grind through a medium plate. Spread meat on a tray and sprinkle water over it. Mix the meat well for 3 minutes. Form into patties or stuff into 22 mm collagen casings and cut to 4 inch lengths. Let sit for a day before cooking. We picked up a meat grinder this week, so this will be another recipe we can play around with! Oh, you will have so much fun! There is breakfast sausage, Italian sausage, bratwurst, linguica, chorizo and so much more!